Morgan Newport stands out in right field. The junior hit a home run and recorded the save in the first game of a doubleheader Saturday. All teams rely on their star players. But what sets the good teams apart is their balance and the ability to have people step up in multiple ways. 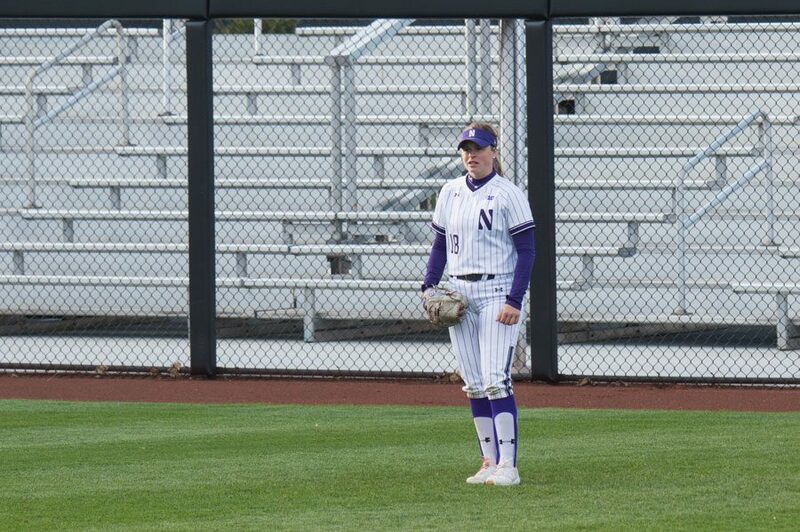 Northwestern used that formula to perfection this weekend in a stirring sweep of No. 25 Wisconsin (30-8, 7-5 Big Ten), which gave the Wildcats (33-7, 12-0) sole possession of first place in the conference. The first game of this series was a grinder. The second, a slugfest. The third, a marathon. The series featured an outfielder pitching and a pitcher playing the outfield, another pitcher getting her first career at-bat as a senior and the Cats tallying more runs than hits in each of the first two games. But the defining moment of the series, and of NU’s season so far, came in the 10th inning of the nightcap of Saturday’s doubleheader. The sun had disappeared behind Welsh-Ryan Arena and daylight was quickly fading. It was with that backdrop that Lily Novak, a senior first baseman mostly known for her defense who entered the weekend with just three career home runs, launched a towering blast that just cleared the left-center field fence to send the largest crowd of the season at Sharon J. Drysdale Field home happy. Novak’s walk-off dinger epitomized the balance throughout the Cats’ lineup. The top of the order was strong in both games Saturday — sophomore second baseman Rachel Lewis, senior left fielder Morgan Nelson and freshman shortstop Maeve Nelson all homered. But NU also got major contributions from junior Morgan Newport in the No. 5 hole, freshman pitcher Danielle Williams from the eighth spot and Novak from the seventh position. The balance was also on display with regards to the pitching staff. Williams threw 130 pitches in Friday’s game and 160 in Saturday’s second game, covering all 10 innings. But when the plan for Saturday’s first game went off script, a pair of little-used veterans stepped up in a big way. Sophomore Kenna Wilkey, the Cats’ second-strongest pitcher, struggled against the Badgers’ powerful lineup, prompting Drohan to bring in senior Kaley Winegarner in the second inning. Winegarner battled hard and allowed only one run in 3.1 innings on a home run by the Big Ten’s leading hitter, Kayla Konwent. She even batted for the first time in her career, lining out to third base. When Winegarner put two runners on base in the fifth, Drohan brought Newport, a major part of the rotation last year but mainly an outfielder this year, into the circle. Newport, pitching for just the fourth time since the beginning of March, had her best outing of the year, going the final 2.1 innings without allowing a hit as NU held its three-run lead.